As part of our annual Christmas crafting my husband & I hit up Michael's in search of a craft to do together. We came across some of their standard wooden photo frames and decided to make our own Christmas photo frames. We first spray painted the frames the night before so that all the edges would be nice. My husband cutting out some paper for his frame. Me using an x-acto knife to cut our the centre of the frame. Getting the placement just right. Final products! 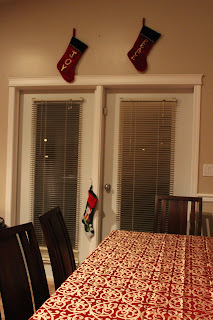 Awesome holiday frames! I actually LOVE them. And they look adorable in our window now! I just need to print off some holiday photos to fill them up. 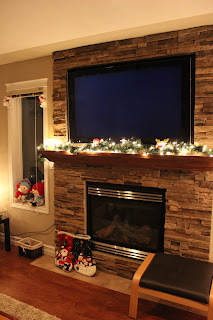 This is my husband's frame :) He added the lights to give it some extra pizazz. My holiday frame :) Including specially cut out Christmas trees and a clothespin banner. Fun :) Stay tuned for more wonderful Christmas crafts! Christmas is on the horizon! With Christmas comes a multitude of great friends, family, parties, crafts, etc. It also comes with massive dinners, turkey, potatoes, Christmas cookies, stocking treats, nuts & bolts, etc. In an attempt to maintain my weight over the Christmas season, I've vowed to start being healthier now. That means that over the holidays, if I want to eat nuts & bolts at the end of the day, I have to eat healthy food the whole rest of the day. This is no easy feat for a cheese and carbohydrate lover. Anyway, here's a delicious recipe that I found on Pinterest to motivate some healthy meals! 2. mix lime juice, garlic, and olive oil to form a dressing. 3. Chop cucumber, red pepper, and avocado. 4. When quinoa is ready, drain it and add it to your plate. Add veggies (really you can put whatever you want, and whatever quantities you want, but I strongly recommend the avocado!). Drizzle on some dressing and voila! It was really delicious the first time I made it. I added on of my carrot muffins to the side of the meal - obviously avoiding starch is not my strong point! lol. This is a start though! 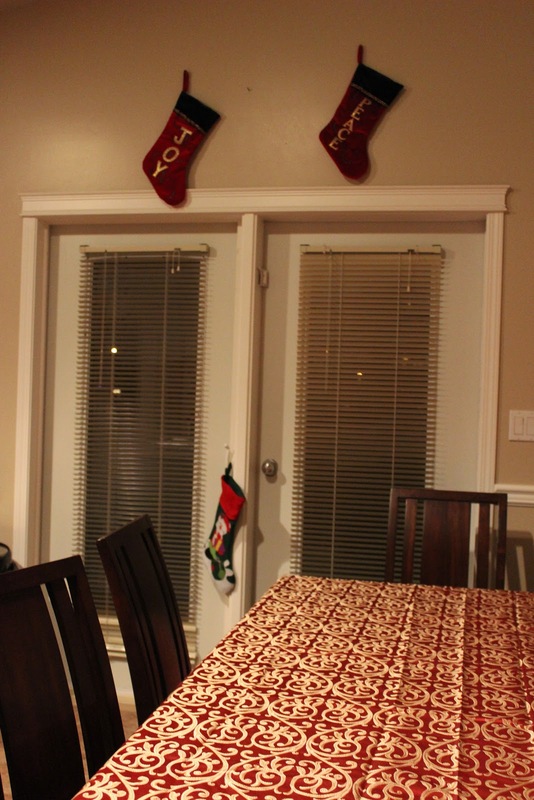 Stockings hung above the door and our fancy tablecloth. 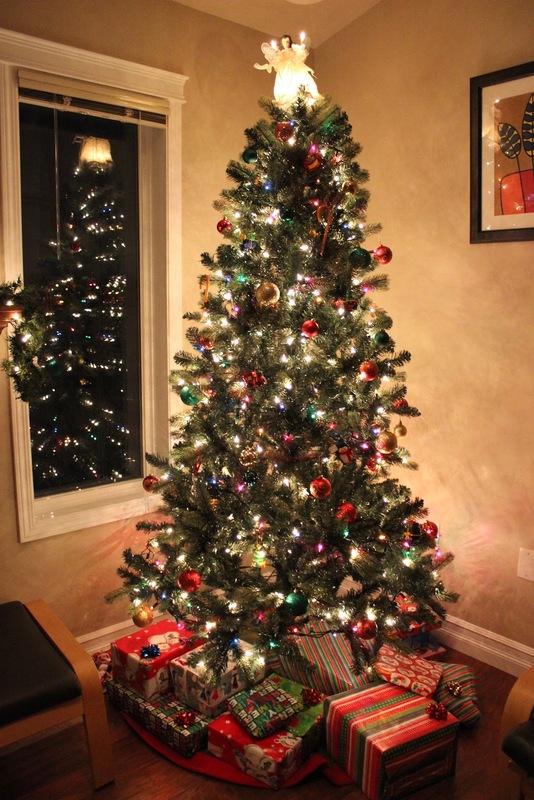 Our Christmas tree!! Complete with hand-made ornaments, and already wrapped Christmas gifts and stocking stuffers. 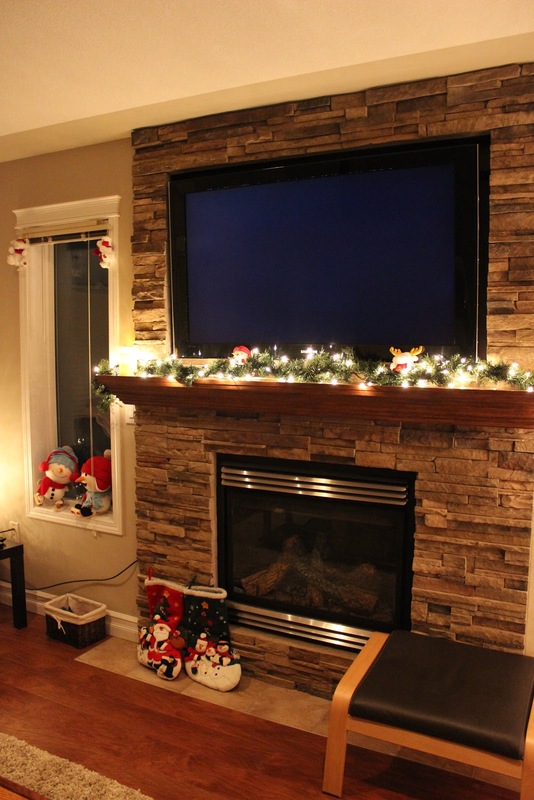 I just like the Christmas blanket - and also there are snowmen hanging from the light fixture... lol. Our aunt made this amazing runner for us as a wedding gift! It's green so we decided to keep it with our Christmas stuff and bring it out once a year. The big picture (minus the tree). I just love the feeling of being in a room with soft Christmas lights and music. Makes me want to drink tea and read a book, or blog. I am very thankful this year for the amazing man I married. Very thankful for our puppies. Very thankful for the life we have together. Since we leave early for my parents' place this year, we are opening presents before we go. Leaving early also meant that I needed plenty of time to enjoy the Christmas decor. Such a great time of year :) The excitement of Christmas is looming around the corner, there's snow on the ground, my husband's work schedule is slowing down. So much good waiting around the corner! 3. Setting up all the Christmas decorations! 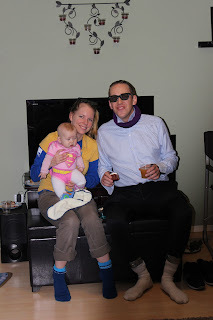 We've been slowly accumulating items, and I can't wait to see it all set-up in the new house. 4. Baking cookies and making nuts and bolts until Mr. A gains 10 pounds, lol. I love holiday baking. Usually I pick out a nice selection of holiday songs to play in the background. Then you can sing while you bake! 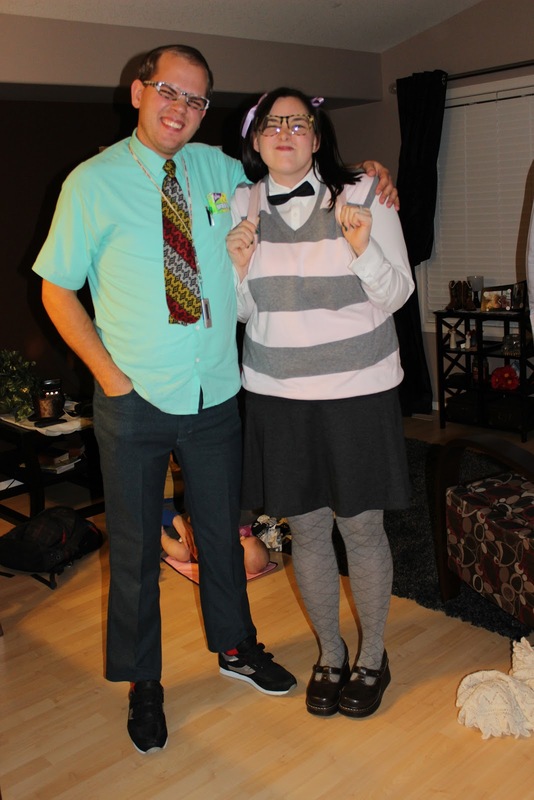 So we didn't have a Hallowe'en shin-dig to go to this year, but we did go to a Hallowe'en-esque event where everyone was instructed to dress like a nerd! There's not much else to tell really.... just a bunch of nerds hanging out, lol. People were very creative with their nerd attire. Value village was probably rampaged by this small group, but it was well worth it. There were some nerd themed games... one of which involved a race to finish a word search. Obviously, I finished first! I rock nerdy activities! Mr. A obviously finished last.... he gave up about 2 minutes in and started drawing dragons on his page. That's when I realized how similar my marriage is to my parents, lol. Dad wouldn't have even pretended to start... and mom probably would've won, and she could have defined all the words for you! Funny how we start to parallel our parents lives at some point. My nerdy smile! Also.. check out the sweet backpack! More nerds. Special props goes to the friend in the middle that actually dressed like a box of nerd candies. Creative! She even made it herself... far exceeds my talents. Nerds playing with a remote control helicopter. They didn't even have to plan this. The naturally nerdy just started playing all on their own! 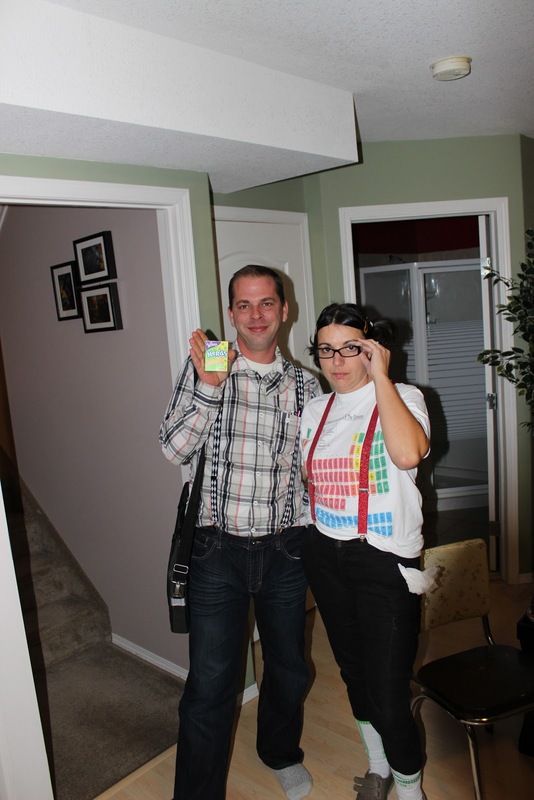 Nerdy brother and sister-in-law! Note the periodic table on her shirt! lol. Nerd couple. Pants too short. Pigtails. Bow tie. Plaid glasses. Velcro shoes. Classic nerd.